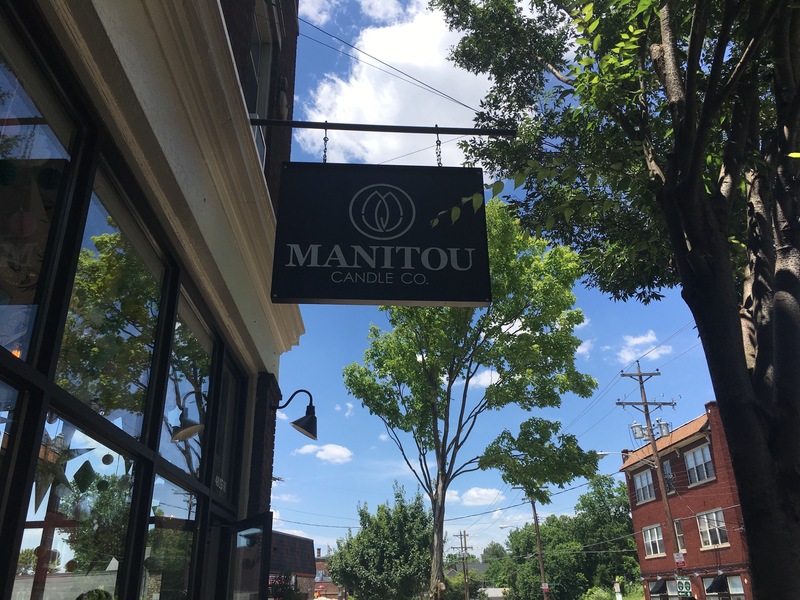 Manitou Candle Co. – Go There. Try That. My girls know I love new experiences! 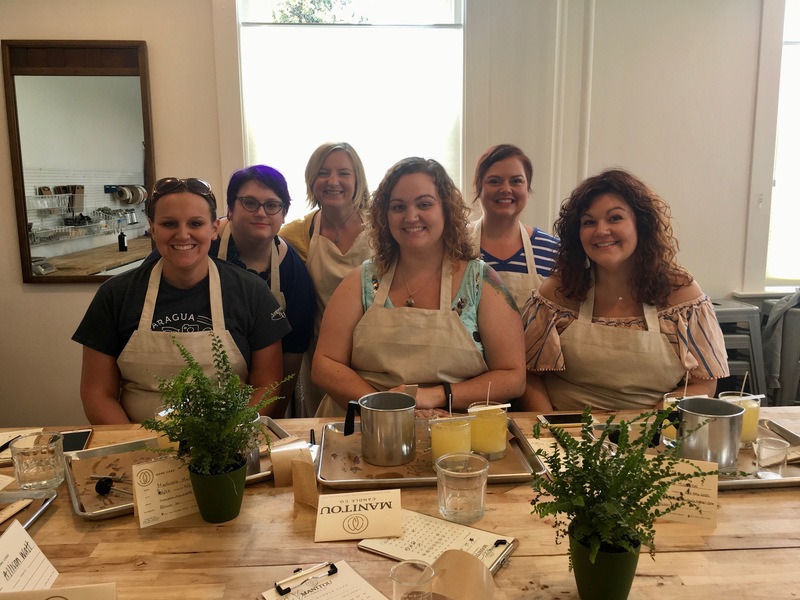 For my birthday this year, they got together and surprised me by scheduling a class at Manitou Candle Co., a new place on Eastern Avenue. Ain’t nothing better than a girl’s day out! Plus, I’ve never really made candles before . . . well, unless you count that time at youth camp when we learned about the Colonial Days! Pretty sure we made those candles out of rendered animal fat. Yep, this is different. Much different. 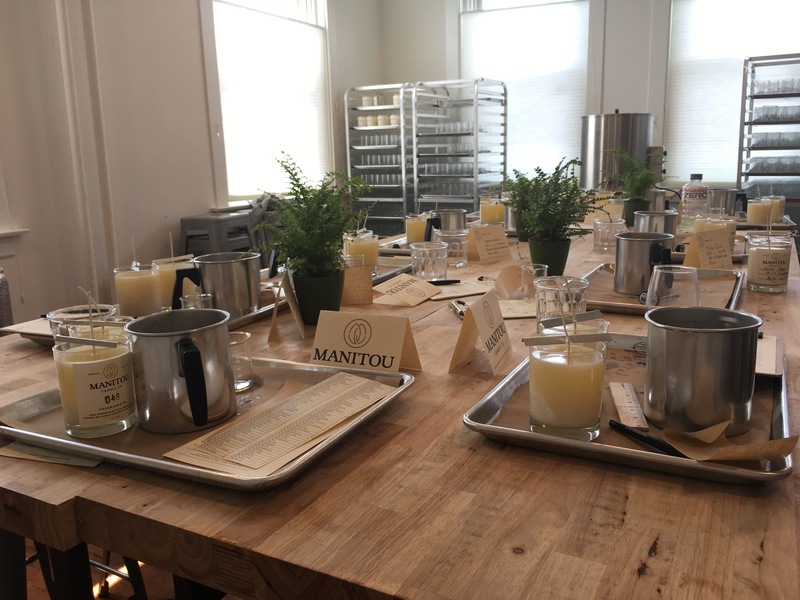 The environment at Manitou Candle Co. is bright, clean and welcoming. This simplicity makes picking from the nearly 100 scents less daunting. We also found the staff sweet and enthusiastic. 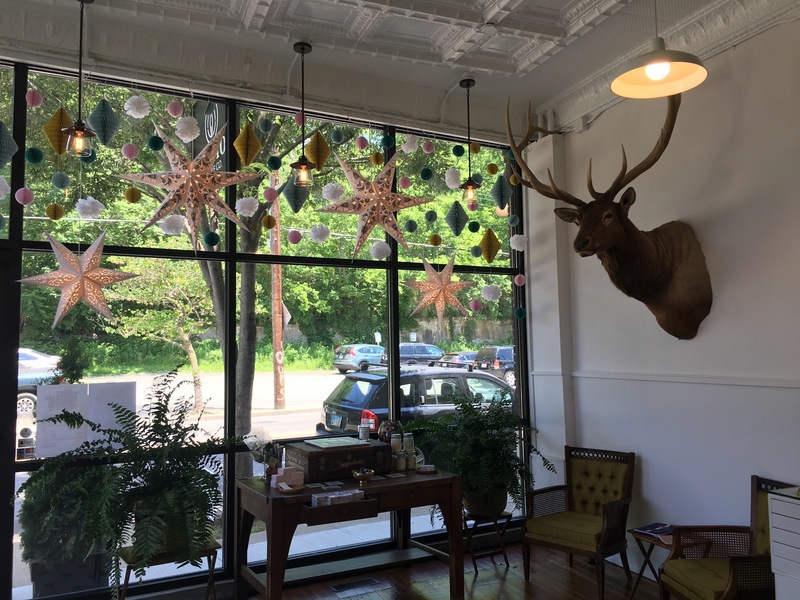 Manitou is an inviting space. Classes take place in the back room; I was geeky excited when I saw all my tools neatly arranged at my seat. Once we began, our teacher asked each of us to call out our favorite smells. Certain smells correlate with numbers on a personal notepad. As people take turns sharing, students circle numbers that correspond with individual likes. Or, you can eliminate scents that you know you don’t like. For example, I’m not into citrus or flowery smells (X on those), but others were all about those smells. I tend to prefer clean, minty, and herbal (big circles on those numbers)! Look how pretty that set up is! This is such a smart way to begin; otherwise, we’d still be there sniffing 100 different canisters. Trust me; the pressure to get just the right combo is a real thing! Some of us blended fragrances while others stuck with 100% of one. Each person makes two of the same candles. It would be even better to make two different candles, but I understand it’s because of the mixing process. My friend Korie and I agreed to share our candles so that in the end, we had two totally different scents that we each loved. One of my favorite parts? You get to name your candle company and you get to name your candle. I’m sorry, but that’s just cool! So cool! 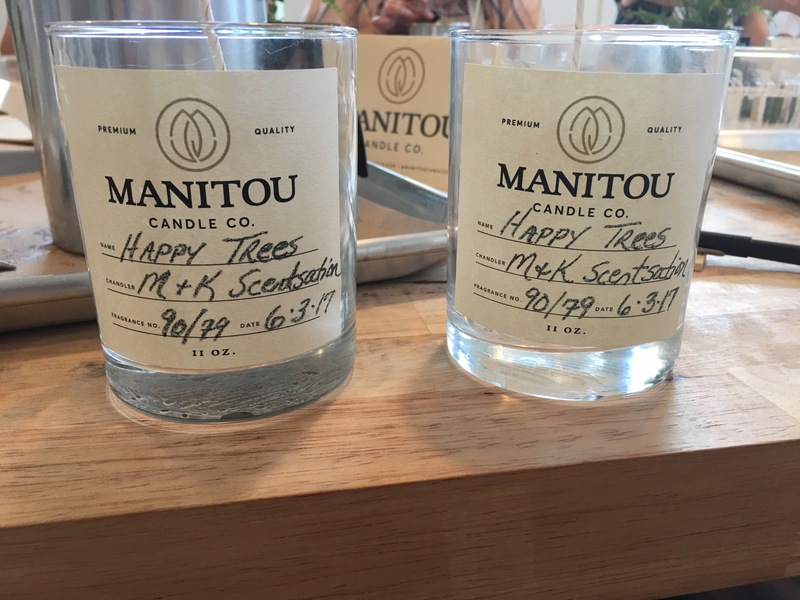 Our “company”, M + K Scentsation, created Happy Trees and Gentle Man. I’m absolutely certain these could be best sellers. You’re intrigued, right?! I’ve seriously been burning my candles almost daily- one in the bedroom and one in the living room. Because soy burns cooler, I get to enjoy these beauties longer than I would other candles. Also, because these candles are all soy based, the burn is clean and non-toxic. Not only did I get time with some of my favorite peeps, but I got two beautiful gifts as well. Six girls= six totally unique candles. Love the individuality of the process. 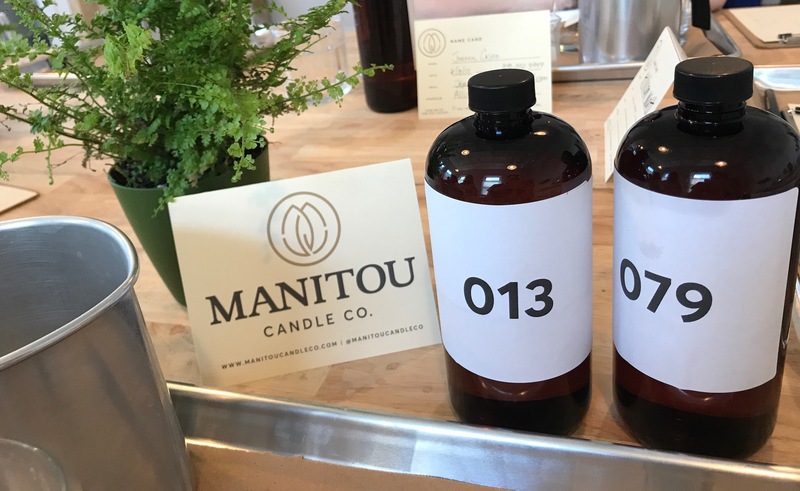 I am already excited to go back to Manitou Candle Co. I might make Christmas gifts . . . or, I could just make more for myself. (wink. wink.) If you don’t feel like attending a workshop, please stop in and purchase ready-made candles! If you dig craft beer, Streetside Brewery is next door! Grab a drink when you’ve finished your candles. They have a nice outdoor patio. 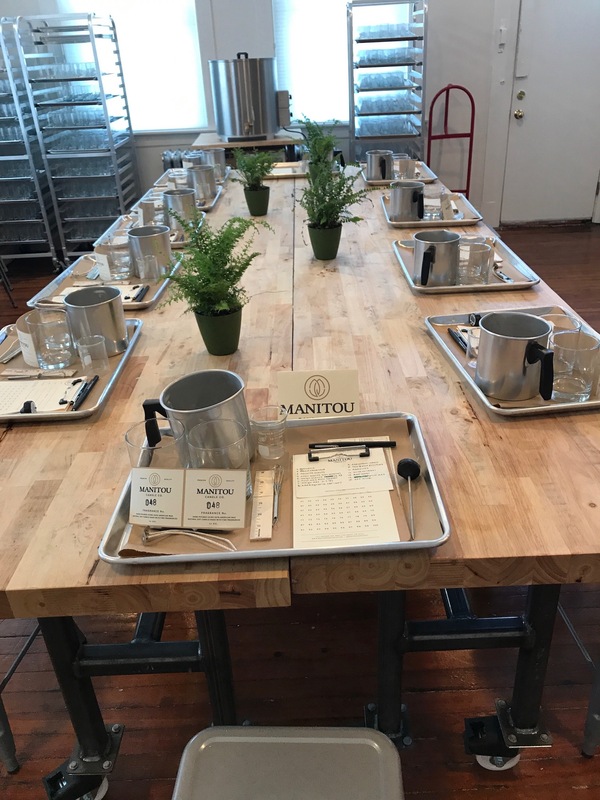 GO THERE (Manitou Candle Co.)! TRY THAT (Workshop)! I will look for this the next time I’m on Eastern. Sounds interesting! I love nice scents.